In this essay we attempt to estimate global money supply and relate it to global supply of gold. For the global money supply, we use money supply figures for currency in circulation from 86 selected currencies, from 81 independent countries and five monetary unions. For the global supply of gold, we use data from the World Gold Council (WGC). Finally, we attempt to interpret the price of gold as a relationship between global money supply and global gold supply. For money supply, we consider five monetary unions and 81 sovereign (independent) currencies. Here is a quick survey of those unions. The first monetary union is the European Monetary Union (EMU), commonly known as the Eurozone, and using the Euro as a common currency. It includes 16 Western European countries, such as Germany, France, Belgium, and Austria. The second currency union is the East Caribbean Currency Union, which uses the East Caribbean Dollar, and includes members like Antigua and Barbuda. The third union is the West African Monetary Union (UEOMA), using the West African Franc, and includes members like Benin and Burkina Faso. The fourth union is the Central African Monetary Union, technically known as CEMAC, which uses the central African Franc, and includes members like Cameroon, Chad, and Congo. The fifth union is technically known as the IEOM, uses the French Pacific Franc, and includes members like French Polynesia and New Caledonia. Table 1 below, Currency Unions, provides the details for each currency union, such as its popular and technical name, its currency name, currency code, and member countries. The five currency unions and 81 independent currencies cover a total of 122 countries that make up 98.4% of the world's GDP and 86.1% of the world's population. Figure 1 below visualizes the coverage. Areas with grey color on the map represent countries without available data. Areas with blue, red, and orange color represent the three most important economic unions, respectively the European, the West African, and the Central African Unions. Reliable money supply data could not be found for all countries. The five largest economies for which data was unavailable were: Morocco, Vietnam, Angola, Sudan, and Cuba. These countries comprise 0.6% of world GDP and 2.8% of world population. Their relatively insignificant share of the global economy makes us believe that their exclusion from our analysis would not materially affect our results and our conclusions. Myanmar (Burma) requires a special note. Cross-country money supply comparisons rank Myanmar very high. This apparent paradox arises from the discrepancy between the overvalued official exchange rate and the more realistic "black market" exchange rate. For the local currency, the 2005 money supply is reported at 1.83 trillion kyat (MMK). The official exchange rate (6.7147 MMK to 1 USD) makes this the fifth most valuable currency in the world with a value of US$273 billion. The unofficial black market exchange rate (1300 MMK to 1 USD) provides a value of only US$1.4 billion. In our opinion, the official rate overvalues the currency roughly 200 times and introduces an obvious bias in the data, so Myanmar money supply was not included. The Bank of International Settlements (BIS) provides a link on their website that lists central banks for different countries. The following charts and tables use money supply data from these official websites, whereby each link identifies the economic area. Unfortunately, there is no unified methodology for calculating different monetary aggregates. This presents analytical problems as different countries use different definitions of money supply. Different definitions, in turn, require different methodologies for calculating different monetary aggregates, which immensely complicates cross-country comparisons. Unfortunately, we are not aware of any widely accepted solution to this particular problem. Quite commonly, money is conceptually defined across a continuum from narrow money to broad money. Narrow money typically includes highly liquid forms of money that function as a medium of exchange, while broad money additionally includes other less liquid forms of money that function as a store of value. Monetary aggregates are conventionally denoted in ascending order by M0, M1, M2, M3, etc. Smaller aggregates like M0 and M1 correspond conceptually to narrow money supply, while larger aggregates like M2 and M3 correspond to broad money supply. We should note that in the heady days of monetarism, economists have further elaborated those aggregates and have devised M4, M5, M6, etc. Most generally and most commonly, but not necessarily uniformly, M0 refers to outstanding currency (banknotes and coins) in circulation, but excludes cash reserves. M1 includes M0, demand deposits, and cash reserves. M2 includes M1 and savings deposits, conventionally maturing within two years or redeemable at notice within three months. M3 includes M2, repurchase agreements, money market funds, and debt securities maturing within two years. Additionally, not every country publishes all four of the common monetary aggregates. For example, the U.S. Federal Reserve ceased publishing M3 on May 23, 2006. However, various independent sources have successfully reconstructed the M3 series and have continued to publish it. 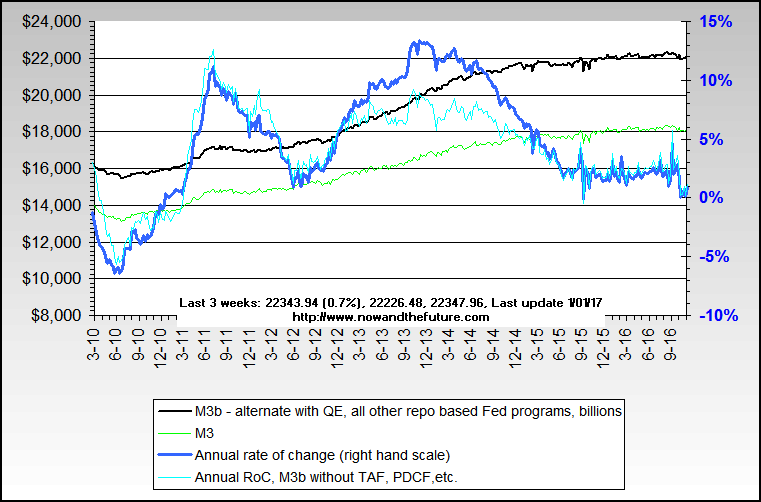 For our analysis, we concentrated exclusively on the narrowest measure of money supply, M0. Conceptually, it corresponds best to the monetary interpretation of gold. We expect it to relate well to the value of gold, although further studies may be necessary to analyze the relationship of gold to higher aggregates, such as M1, M2, and M3. The following pie charts in Figure 2 below show the relative value of global currencies (M0) when converted to USD for means of comparison. The left-hand side of the figure shows that the four largest currencies in circulation comprise nearly three-quarters of the global narrow money supply. Not surprisingly, those currencies are the Euro, the U.S. Dollar, the Japanese Yen, and the Chinese Yuan. The right-hand side zooms in on the "other" 79 currencies of the left-hand side that were simply too small to see when shown together with the big currencies. We show the next thirteen most important currencies that comprise more than half of the "other" category. It is clear from the picture that those thirteen currencies are relatively small compared to the big currencies. Nevertheless, it illustrates well their portion of the global money supply. *The Reserve Bank of Zimbabwe ceased publishing any statistics after June 2008 at which point 1 USD equalled 40.9 billion Zimbabwe Dollars. It is clear from the table above that while their growth rates are relatively high, the value of these currencies are relatively small in absolute terms. On the other hand, when converted to U.S. Dollars as of Oct 31, 2008, the fastest growing currencies in absolute terms are shown in Table 3 below. From the comparison of the two tables above, it is quite obvious that the rapidly inflating currencies are too small to significantly affect global money supply growth rates. From the second table it is clear that the "big" currencies contribute the bulk of increases in the global money supply. From this particular analysis we can conclude that a sample of the largest 10-15 currencies in the world can provide a meaningful analysis of the growth rate of global money supply. It is estimated by the WGC that a total of 165,547 tonnes of gold have been mined. This is equivalent to about 5.32 billion ounces. Most of that gold is currently available as supply at some price, possibly much higher than the current market price. Given that the total gold supply is relatively stable and that very little gold is consumed in industrial processes, the annual increase in the supply of gold from current mining is relatively stable -- about 1.5%. Figure 3 below shows the calculation of the value of all gold ever mined. The top left graph in the figure shows the price of gold for the period of 1970-2008. The top right graph in the figure shows the quantity of all gold mined for the same period. Finally, the bottom graph in the figure shows the product of the price with the quantity, which represents the value of all gold ever mined. Figure 4 below shows a historical comparison for the value of mined gold against that of currency in circulation. This chart essentially overlays our previous data on global money supply with the data on the value of gold. It provides the basis for our valuation of gold. Our analysis essentially begins with the collapse of Bretton Woods. The first major observation is that during the 1970s, gold advanced much farther than money supply. There are two fundamentally different explanations for this phenomenon. The first explanation, espoused by neoclassical economists, is that gold is inherently more volatile and more unstable than paper currencies. The other explanation, espoused by the School of Austrian Economics, holds the opposite to be true and that price swings in gold reflect the discounted value of expected future inflation. In other words, Austrian economists contend that the monetary policy associated with paper currencies is inherently unstable, and this instability of paper currencies is magnified when discounted to the current price of gold; this discounting mechanism generates the apparent excessive volatility of gold. The second fundamental observation is that during the 1970s, gold rose at significantly faster rates than money supply. Neoclassical economists explain this with the inherently volatile nature of gold. However, volatility simply cannot explain this 10-year trend. Volatility relates to variability in prices around the trend, not to the direction of the trend. Neoclassical economists have no meaningful explanation here, except to resort to volatility of gold and irrational behaviour of gold "bugs". On the other hand, the explanation by Austrian economists is straightforward and logical: as inflation accelerated throughout the 1970s, the discounting mechanism of the gold market resulted in accelerating price of gold from the rising inflationary expectations. The third fundamental observation is that there is a possibility for a long-term divergence between the value/price of gold and global money supply. This divergence is obvious for the period of 1980-2000. The neoclassical school has not offered a satisfactory explanation for this phenomenon except to point out disparagingly that gold is a "barbarous relic", "irrelevant" or "dead". The Austrian explanation, however, is again quite straightforward: the period was generally characterized by disinflation, so the discounting mechanism produced lower gold prices due to the falling inflationary expectations that more than offset increases in money supply. This analysis leads us to speculate that while divergences caused by inflationary expectations can last for a very long time, even decades, the long-term price of gold is driven by global money supply. 2 It was illegal for Americans to own gold for investment purposes since President Roosevelt signed Executive Order 6102 on April 5, 1933. It wasn't until Dec 31, 1974 when Americans could own once again own gold coins, bars and certificates. 3 In nominal terms, gold did not surpass this level until Jan 8, 2008 - nearly some 28 years later. Published originally on DollarDaze.org - Jan 27, 2009.